I have received questions about my blog name "Pregnant Daddy". Alot of people were wondering why i gave such a strange name. Is it because that i am really pregnant? Or am i actually a woman posing as a man writing for the blog? Well, to clear the air. I am indeed a man and no i am not pregnant. 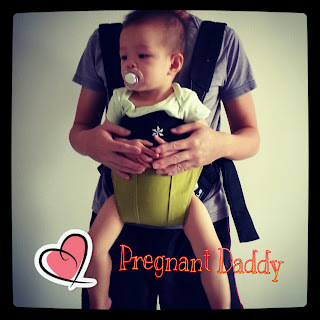 To make it easier to explain, i have uploaded a picture of myself carrying my kid in a baby carrier. Initially, i wanted to call myself "Carrier Daddy". But it sounds weird and distant. I wanted to have a name that portrays my close bond with my kids and also a catchy name that people can remember easily. It took me a few days, and it only struck me when i was looking at my wife's photo. She was few months pregnant when i took a photo of her. In that photo, her two hands were touching her stomach and she was feeling for the baby's movements. To me, it is the greatest thing that a woman can experience. And for me to imitate or experience such phenomenon, the best alternative would be carrying my kid on a baby carrier. Hence, when the opportunity came, i took this picture. My kid's hands safely held by mine...as if i was pregnant.